The Appenzeller Mountain Dog is one of the four Sennenhunds, or Swiss Mountain Dogs, the other three being the Greater Swiss, Bernese and Entlebucher. The word Senn is the term for Alpine herdsmen, so a Sennenhund is a 'dog of the Senn'. Traditionally the Appenzeller Mountain Dog was a cattle driver, although it can also work with sheep and goats. As secondary tasks they were used to protect the livestock, as property guards, for general farm work and as a rescue dog after avalanches. It is believed that the Appenzeller Mountain Dog is descended from large Molossers brought to Switzerland either by the Romans or Phoenician traders. 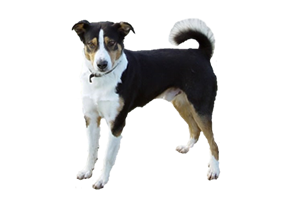 Unlike the other Sennenhunds, it seems as if there is a bit of spitz in the breed as well (evident in the curled tail. ), which adds to a second theory that they are descended from a native dogs. This specific type originated in Appenzell, which is in the east of Switzerland, near the Austrian border. Serious breeding programs for the Swiss Mountain Dogs did not being until the late 1800s and they were not formerly separated into distinct breeds until 1908. Is the Appenzeller Mountain Dog Right for You?